The Bible is the book of sacred writings of God’s People of the Old and New Testaments. These writings are also called the Old and New Covenants. The People of God of the Old Testament were the Hebrew people, the descendants of Abraham, Isaac and Jacob. Jacob’s name was changed by God to Israel (Genesis 32:28). This people came later to be called the Jews (a word referring to the Tribe of Judah). The Jewish people remain forever as God’s chosen people; for from them “according to the flesh” Christ, the Son of God, was born (Romans 9:5). This Son of God is Jesus of Nazareth, the Messiah-King of Israel and the Saviour of the world (see Matthew 1-2, Luke 1-2, Romans 8:3, Galatians 4:4, Hebrews 1-5). The Old Testamental writings of the People of Israel have always been called “The Scriptures,” and they remain forever as the word of God for all who believe in God and wish to know His divine Truth and to do His divine Will. "Testament" is another word for "covenant." Although God made a covenant with Noah (Genesis 9:8-17) on behalf of all humanity, the main covenant which influences most of the Old Testament is the covenant that God made with Abraham (see Genesis 15-17). The Prophet Jeremiah wrote that the Lord was preparing a new covenant between Himself and His People: “‘Behold, days are coming,’ says the Lord, ‘when I shall make a new covenant with the house of Israel and the house of Judah, not according to the covenant I made with their fathers in the day I took hold of their hand to bring them out of the land of Egypt; for they did not abide in My covenant, and I disregarded them,’ says the Lord. ‘For this is the covenant I will make with the house of Israel after those days,’ says the Lord. ‘I will surely put My laws into their minds and write them on their hearts. I will be as God to them, and they shall be as My people. Each shall not teach his neighbour and each his brother, saying, “Know the Lord,” for all shall know Me, from the least of them to the greatest of them. For I will be merciful to their wrongdoings, and I will no longer remember their sins’” (Jeremiah 38:31-34 LXX [Jeremiah 31:31-34]). The People of God of the New Testament (New Covenant) are the Christians – those who believe in Jesus as “the Christ, the Son of the Living God” and who belong to the Church which He has founded upon faith in Himself (see Matthew 16:13-20). Christians are also called the “New Israel.” The People of God of the New Testament also have their holy writings which bear witness to Christ and which are affirmed to be the word of God. They include the four Gospels, many epistles (letters), and an Apocalypse. The Bible is called the written word of God. This does not mean that the Bible fell from heaven ready-made. Neither does this mean that God dictated the Bible word for word to men who were merely His passive instruments. Rather, it means that God has revealed Himself as the true and living God to His People. As one aspect of His divine self-revelation, God inspired His People to produce scriptures, i.e., writings which constitute the true and genuine expressions of His Truth and His Will for His People and for the whole world. The Bible is the word of God in human form because its origin is not in man but in God, Who willed and inspired its creation. In this sense, the Bible is not like any other book. In the Bible, in and through the words of men, we find the self-revelation of God, and we can come to a true and genuine knowledge of Him and His will and purpose for man and for the world. In and through the Bible, human persons can enter into communion with God. It is the faith of the Orthodox Church that the Bible, as the divinely-inspired word of God in the words of men, contains no formal errors or inner contradictions concerning the relationship between God and the world. There may be incidental inaccuracies of a non-essential character in the Bible, because human beings were doing the writing. But the eternal spiritual and doctrinal message of God, presented in the Bible in many different ways, remains perfectly consistent, authentic, and true. God reveals Himself to us (see Psalm 117/118:27) throughout history. He is always the same. He is always love (see 1 John 4:16). The writers of the Bible did so over many hundreds of years. We can see the one and the same Lord God consistently addressing us through them all. The Bible has many different human authors. Some books of the Bible do not indicate in any way who wrote them. Other books bear the names of persons to whom authorship is ascribed. In some cases it is perfectly clear that the indicated author is in fact the person who actually wrote the book with his own hands. In other cases it is as clear that the author of the book had another person do the actual writing of his work in the manner of a secretary. In still other cases it is the Tradition of the Church, and not seldom the opinion of biblical scholars, that the indicated author of a given book of the Bible is not the person (or persons) who wrote it, but the person who originally inspired its writing, whose name is then attached to it as its author. In a number of instances the Tradition of the Church is not clear about the authorship of certain books of the Bible, and in many cases biblical scholars present innumerable theories about authorship which they then debate amongst themselves. It is impossible to establish the authorship of any book of the Bible by scholarship alone, however, since historical and literary studies are relative by nature. The witness of the early Church Fathers is more reliable because these Fathers lived not long after the books of the New Testament were written. 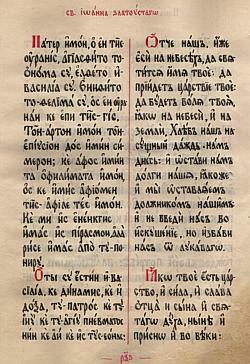 Because the Orthodox Church teaches that the entire Bible is inspired by God Who in this sense is its one original author, the Church Tradition considers the identity of the human authors as incidental to the correct interpretation and proper significance of the books of the Bible for the believing community. In no case would the Church admit that the identity of the author determines the authenticity or validity of a book which is viewed as part of the Bible, and under no circumstances would it be admitted that the value or the proper understanding and use of any book of the Bible in the Church depends on the human writer alone. The Bible is the book of sacred writings for God’s People, the Church. It was produced under divine inspiration in the Church, by and for the Church, as an essential part of the total reality of God’s covenant relationship with His People. It is the authentic Word of God for those who belong to God's chosen assembly of believers, to the Israel of old and to the Church of Christ today and forever. The Bible lives in the Church. It comes alive in the Church and has the most profound divine meaning for those who are members of the community which God has established, in which He dwells, and to which, through His Word and His Spirit, He has given Himself for participation, communion and life eternal. Outside of the total life and experience of the community of faith, which is the Church of Christ, “the pillar and ground of the truth” (1 Timothy 3:15), no one can truly understand and correctly interpret the Bible. First of all, we must understand that no prophecy of scripture is a matter of anyone’s own interpretation, because no prophecy came by the impulse of man, but men moved by the Holy Spirit spoke from God (see 2 Peter 1:20-21). Scholars of the Bible can help us to understand its divine contents and meaning. Through their archeological, historical, and literary studies they can offer much light to understanding the words of the scriptures. But by themselves and by their academic work alone, no one can produce the proper interpretation of the Bible. Only Christ, the living and personal Word of God, Who comes from the Father and lives in His Church through the Holy Spirit, can make God known and can give the right understanding of the scriptural word of God. “In the beginning was the Word, and the Word was with God and the Word was God. ... And the Word became flesh and dwelt among us, … full of grace and truth. ... For the law was given through Moses, but grace and truth came through Jesus Christ. No one has seen God at any time. The only-begotten Son, who is in the bosom of the Father, He has declared Him” (John 1:1, 14, 17-18). Jesus Christ, the Word of God in human flesh, alone makes God known. And Jesus, besides being Himself the living incarnation of God, the living fulfilment of the law and the prophets (see Matthew 5:17), is also the One by whom the Bible is rightly interpreted. “Then [being risen from the dead] He said to them, ‘O foolish ones, and slow of heart to believe in all that the prophets have spoken. Ought not the Christ to have suffered these things and to enter into His glory?’ And beginning at Moses and all the Prophets, He expounded to them in all the Scriptures the things concerning Himself” (Luke 24:25-27). “Then He said to them, ‘These are my words which I spoke to you while I was still with you, that all things must be fulfilled which were written in the law of Moses and the Prophets and the Psalms concerning Me.’ And He opened their understanding, that they might comprehend the Scriptures” (Luke 24:44-45; see also John 5:45-47). Jesus Christ remains forever in His Church by the Holy Spirit to open our minds to understand the Bible (see John 14:26, 16:13). Only within Christ’s Church, in the community of faith, of grace, and of truth, can we, filled with the Holy Spirit, understand the meaning and purpose of the Bible’s holy words. Thus, speaking about those who do not believe in Jesus as the Messiah, the apostle Paul contends that when they read the Bible a “veil” hides its true meaning from them because “when one turns to the Lord, the veil is taken away” (2 Corinthians 3:16). “But even to this day, when Moses is read, a veil lies on their heart. Nevertheless when one turns to the Lord, the veil is taken away. Now the Lord is the Spirit; and where the Spirit of the Lord is, there is liberty. But we all [i.e. believers in Christ] with unveiled face, beholding as in a mirror the glory of the Lord, are being transformed into the same image from glory to glory, just as by the Spirit of the Lord. Therefore, ... we have renounced the hidden things of shame, not walking in craftiness nor handling the word of God deceitfully, but by manifestation of the truth commending ourselves to every man’s conscience in the sight of God. But even if our gospel is veiled, it is veiled to those who are perishing, whose minds the god of this age has blinded, who do not believe, lest the light of the gospel of the glory of Christ, who is the image of God, should shine on them” (2 Corinthians 3:15-4:4). In the New Testament, Christ not only provides the correct interpretation of the Bible, but He also allows the believers themselves to be directly enlightened by the Holy Spirit and to be themselves “an epistle of Christ ... written not with ink but by the Spirit of the living God, not on tablets of stone but on tablets of flesh, that is, of the heart” (2 Corinthians 3:3). Thus is fulfilled the prediction of the Old Covenant that in the time of the Messiah “they all shall be taught of God” by direct divine inspiration and instruction (see John 6:45, Isaiah 54:13, Ezekiel 36:26, Jeremiah 38:33 LXX [Jeremiah 31:33], Joel 2:28,29 LXX [Joel 3:1-2], Micah 4:2, et. al.). It is only within the living Tradition of the Church under the direct inspiration of Christ's Spirit that the proper interpretation of the Bible can be made.